Sheriff from Navan: Meath Writers' Circle, Book Launch. Meath Writers' Circle, Book Launch. The Meath Writers' Circle is launching a book of poetry and prose on Thursday 3rd March in the Trim Castle Hotel at 8pm. The book will mark the Centenary of the 1916 Rising and it also has material which covers the period 1914 to the present day. There will be a mixture of: music, poetry and song on the night. Price of book €10. 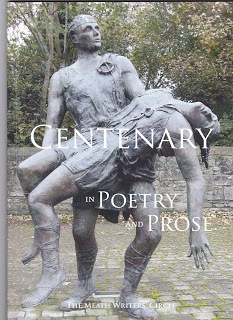 Cover photo of the book pictured above is of Cuchulainn and Ferdia, Ardee Co. Louth and is by the Kells Artist and Sculptor, Ann Meldon Hugh.